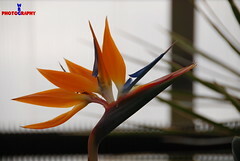 This beautiful Bird of Paradise was captured at the City of Kingston Greenhouses last week. My Photo site at Flickr has a number of other pictures that were taken that you can see. All that is needed is to click on the picture and you will go right there. These little guys were snapped at Acaciagold Kennels on the 20th of Feb. I did a little editing in Phototshop to clean up the background but other than that I got all 5 of them up on the edge of the whelping box. Aren’t these guys the cutest thing. 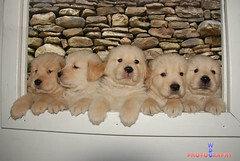 Off to see more of the Goldens of Acaciagold Kennels. This weekend I am off to see the puppies at Acaciagold Kennels. Pat and Tom have two lovely litters and they are now 5 and 3 weeks respectively. On return to the house I will be uploading some of the pictures from the visit. I have already visited there recently and have taken a number of shots already. You can see these at my Flickr Account. This will take you right to the Goldens pages.